here is a Guest Post by Dr. Richard North regarding Theresa May’s announcement that she intended to ask Parliament at Westminster to vote in favour of a General Election on the 08-Jun-2017. Within minutes of Mrs May’s announcement of her intention to seek a general election on 8 June, people I’d never heard of were calling on voters to use the election to reverse the result of the referendum. Yet Mrs May herself had already declared that she wanted contestants to put forward their plans for Brexit, making this about how we leave rather than whether – the debate we should have had before the referendum. To be fair to Lib-Dem leader, Tim Farron, he sees the election in that light, arguing: “If you want to avoid a disastrous Hard Brexit. If you want to keep Britain in the Single Market. If you want a Britain that is open, tolerant and united, this is your chance”. With Corbyn, though, one is never quite sure what he’s thinking. Even then, in his official response to Mrs May’s announcement, he spoke of securing a “Brexit for everyone”, which hardly suggests that he’s going to be pitching for the remain vote. On the face of it, therefore, it doesn’t look as if the re-run idea is going to fly – purely on the basis that none of the main opposition parties are offering this as their position. Possibly the SNP might go with it, but who cares what the whining Sturgeon wants anyway? As to conducting an open debate on how we leave, it is unlikely that the media could follow the arguments if they were properly made, and we have yet to see a politician who has a grasp of the issues sufficient to offer a coherent plan. Certainly, we’re not going to be offered one by Mrs May this side of an election. In her terms, the Government “has the right plan for negotiating our new relationship with Europe”, which amounts to “a deep and special partnership between a strong and successful European Union and a United Kingdom that is free to chart its own way in the world”. 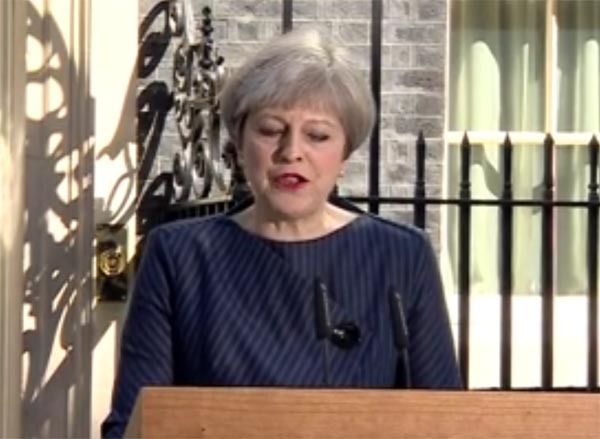 In what can only become the battle of the mantras, she has it that, “we will regain control of our own money, our own laws and our own borders and we will be free to strike trade deals with old friends and new partners all around the world”. The thing is that this is not so much a plan as a series of loosely-drafted aspirations – not only lacking in ambition but also short on realism. Amongst other things, the obsession with making our own laws is as wearying as it is irrelevant. That brings us to the real reason for this election. Mrs May is telling us that she cannot pursue her plan because of the opposition of other political parties. “At this moment of enormous national significance”, she says, “there should be unity here in Westminster, but instead there is division. The country is coming together, but Westminster is not”. Maybe that’s a credible argument, but somehow it doesn’t pass the smell test. There has to be something more. The Guardian’s Patrick Wintour would have us believe that a Brexit mandate, delivering a large Conservative Commons majority, would sweep away the last hope that that the UK’s “aberrant” referendum decision last June could be reversed. Among parts of the EU leadership and the European public, Wintour writes, there remains a lingering belief that the British people can be helped to change their mind. Even though article 50 has been triggered, many EU lawyers believe a legal route is available for Britain to revoke Brexit, probably through a Commons vote in the winter of 2018. In Wintour’s mind, therefore, Mrs May is going to all this trouble and effort just to convince the “colleagues” that Brexit means Brexit, thereby forcing them to concentrate on the task at hand – crafting a workable exit package for the UK. Yet, there is actually nothing in the official response from the European Council that would encourage such a belief. If anything, the “colleagues” are remarkably focused and have set out their stall with some clarity. What is perhaps more convincing is the scenario buried in Mrs May’s own address yesterday, when she reminded us that, “If we do not hold a general election now their political game-playing will continue, and the negotiations with the European Union will reach their most difficult stage in the run-up to the next scheduled election”. To give this more focus, we need to edit it slightly, so that it reads that, if we don’t have a general election now, the negotiations with the European Union will reach their most difficult stage in the run-up to the next scheduled election. And it is at that point that Mrs May will have to make some real concessions, not least on the financial issues. Then to paraphrase Mr Juncker’ s 2007 comment: “We all know what to do, we just don’ t know how to get re-elected after we’ve done it”, Mrs May – with her feet held to the fire by the “colleagues” – will know exactly what she will need to do. But she will also know that it will substantially reduce her chances of winning the 2020 election. Mrs May thus needs a general election now, to get it out of the way and clear the way for her to make unpalatable decisions immediately prior to an election. On the need for that election, she says, “I have only recently and reluctantly come to this conclusion”, in which context we have to ask what it is that has changed so very recently. And there is the clue. Mood music emanating from Brussels and London indicates that it has finally dawned on all parties that the negotiations are not going to be concluded in two years – or at all if the Government follows the line ordained by the “Ultras”. By having an election now, Mrs May buys herself two more years before she has to face a post-Brexit electorate. And this is time in which she can craft a more stable deal without the prospect of sudden electoral death. On the back of a successful election, one can then expect to see the newly victorious Prime Minister go to Brussels and immediately ask for more time – rather than wait for the deadline. Although she has said she will not do this, we are dealing here with someone who said we would stay in the Single Market and we would not have a snap election. The lady is most definitely for turning. Then, having already realised she is between the rock of a “no deal” and the hard place of an unattainable free trade deal, she can devote her attention to crafting a “not the EEA” agreement that covers all the same bases but qualifies as something new and different. Cleverly, in my view, Mrs May has exploited what she calls a “one-off chance” – a window when France and Germany are preoccupied with their elections and the European Union has yet to agree its negotiating position. And if my analysis is anywhere near correct, we could be looking at a new realism pervading No 10, where they have miraculously bought time for an attainable solution. But we can kiss goodbye to Brexit on 29 March 2019.